The find was made during excavations by the Czech Institute of Egyptology at Abousir, an ancient necropolis on the outskirts of modern Cairo. It was a cemetery reserved for members of Egypt’s elite classes living in the nearby capital Memphis, though not members of the royal family. The site is known for its ‘mastabas’, built-up brick platforms which were both a precursor of — and an alternative for — pyramids. “This is a highly unusual discovery since boats of such a size and construction were, during this period, reserved solely for top members of the society, who usually belonged to the royal family. This suggests the potential for additional discoveries during the next spring season,” excavation director Dr Miroslav Barta says. “The discovery is important as this is the only boat of the Old Kingsom to be discovered next to non-Royal tomb which emphasis the status and rank of the Mastaba owner and his relation to the King at that time,” Dr. Mamdouh El Damaty, Minister of Antiquities, said. 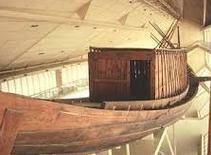 The 18m funerary ship, dated to the end of the 3rd Dynasty about 2550BC, is reported to be in a very well preserved condition. Wooden pegs and natural-fibre ropes used to hold the hull together are still in their original places, offering a rare glimpse of the time’s construction techniques.